I don't know what it is, when I actually set a good amount of time aside to draw nothing decent seems to come out of that time. My best drawing are always during stolen moment here and there. Go figure. But I do like your trainer. I look forward to seeing more! Cheers! how great is that, that your muse is a pair of trainers! If that's the best of the worst then my god what are you like firing on all cylinders? Cute picture! I like it! That's the best of a BAD bunch?! I bet that's nonsense. G, that's the best link ever. I must have a pair! Simply beautiful! 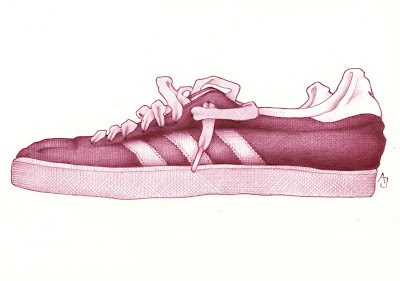 I've always loved Adidas classic range of shoes, but I love this drawing more. The details are great and I really like the way you did the outline as well. Oh, yes, Alex. I loved Samba, too. And, Campus, of course. What a pretty color, and such great detail. Love them. You may not be happy with it, but this is a great sketch. And ballpoint pen no less. Wow. Very nicely done. That was a quick drawing. Amazing. Beautifully done! I find that when I put away my drawings that I am unhappy with, when I go back to them in a few weeks, I often like them a lot better or I can immediately see what the problem is and can fix it. Sometimes the problem is that they turn out differently than what I expected but I need some distance to evaluate them objectively. This is great! If this is what you consider the best of a "bad" bunch, then your best of the best would be mindblowing!!!! Man. I was looking for the shoe blog and I must have taken a wrong turn! It is amazing that you consider this the best in a "bad" bunch. Because this ain't bad, it's good! Janene, I agree. It's often the ones that I didn't like too much that grow onme with time. I, already, like this a lot more than when I first posted (and I did post then, fix it, then repost), I think it was just frustration that led me to being so unkind about it. Thank you ALL. You make my day. I have just stumbled across your blog. It's lovely! Your drawings are so good - I've never tried drawing with a ballpoint pen before, perhaps I should! Sometimes the simplest things around the house make ideal subjects. My most recent being a pair of rubber gloves and a Tea-Towel! I really like your sketches. I would love to be able to draw like you. I will keep practising. I love your shoes! I hadn't been here in so long, and discovered the whole series at once - truly awesome. I don't know anyone else who can draw textures with as much precision as you do. Wonderful! Your luminous ballpoint drawings always amaze me. I like the monochromatic treatment here too. Oh yeah, the gazelles. Especially drawn by you. Wow, the photo here is so nice, i am impressed with the women in your coumtry, they are all so beaufiful. I just ran across your wonderful blog today.It's very beneficial for me, Keep coming up with ideas. Actually they are totally different..I like this post..I will recommend this to my friends.Thanks for this.Appreciate it! You are being to hard on your self. This is a nice piece of art. Do you even know that? Good job.